To better understand diseases with a genetic component, a popular approach is to take skin cells from patients with a disease and use enzymes to coax the cells back along the differentiation pathway to become induced pluripotent stem cells or iPSCs. Such cells can then be programmed to mature into cells, including hematopoietic (blood) cells, which re-create a specific version of each person’s genetic disease in a petri dish for study. Juvenile myelomonocytic leukemia (JMML), an aggressive, difficult-to-treat myelodysplastic and myeloproliferative neoplasm of early childhood, is characterized by excessive proliferation of monocytic and granulocytic cells along with dysplastic features. The ability to induce human induced pluripotent stem cells (hiPSCs) from terminally differentiated cells such as skin fibroblasts provides an opportunity to study disease pathogenesis, which has not been possible in the past with JMML. Now, researchers from Mount Sinai state they have successfully engineered stem cells to better understand the mechanisms behind JMML caused by changes in a key gene. The team state that their new leukemia-in-a-dish also provides new targets for the field to develop new drugs against in JMML. The opensource study is published in the journal Cell Reports. Previous studies show that inherited changes in the DNA code for the gene PTPN11 cause Noonan syndrome, a genetic disease that comes with a high risk for the blood cancer, JMML. In addition, the only current treatment for JMML, a bone marrow transplant to replace the hematopoietic stem cells that become blood cells, is effective in only 50 percent of patients. This has further spurred efforts to understand related disease mechanisms as a step toward designing better treatments. A previous stem cell study used circulating cancerous cells from two JMML patients. However, while valuable, this approach may not capture the earliest stages of JMML leukemogenesis. The mechanisms behind the disease, and what influences its severity, were unknown going into the current study. The current study shows that mechanisms seen in the newly developed model also happen in the bone marrow of people with this kind of leukemia. Results show that hematopoietic cells produced from induced stem cells with PTPN11 mutations known to cause JMML indeed act like cells seen in these patients. Data findings show that ‘gain of function’ genetic changes that happen to increase this protein’s expression were enough to cause leukemia-related changes in cells. Results show that the new leukemia-in-a-dish was able to isolate biological changes specific to hematopoietic cells with PTPN11 mutations, which causes more severe JMML. The group state that these findings provide a toe-hold in efforts to design specific treatments for this form of the disease. The lab explain that iPSCs used to model cancers are often created from cancer cells, a process with comes with a great many mutations in genes that are part of the unstable, frequent cell division and multiplication seen in cancer. They go on to conclude that by starting with skin cells of JMML patients with inherited PTPN11 mutations, they were able to create JMML cells with only these mutations, screening out the ‘genetic noise’ that can obscure disease mechanisms. The team surmise that their results provide further evidence that the severity of this form of leukemia arises from the degree of changes in the gene PTPN11, altering the protein it codes for, SHP-2, and biologic pathways related to it. For the future, the researchers state that these proteins promise to become a focus of drug design efforts. Somatic PTPN11 mutations cause juvenile myelomonocytic leukemia (JMML). Germline PTPN11 defects cause Noonan syndrome (NS), and specific inherited mutations cause NS/JMML. Here, we report that hematopoietic cells differentiated from human induced pluripotent stem cells (hiPSCs) harboring NS/JMML-causing PTPN11 mutations recapitulated JMML features. 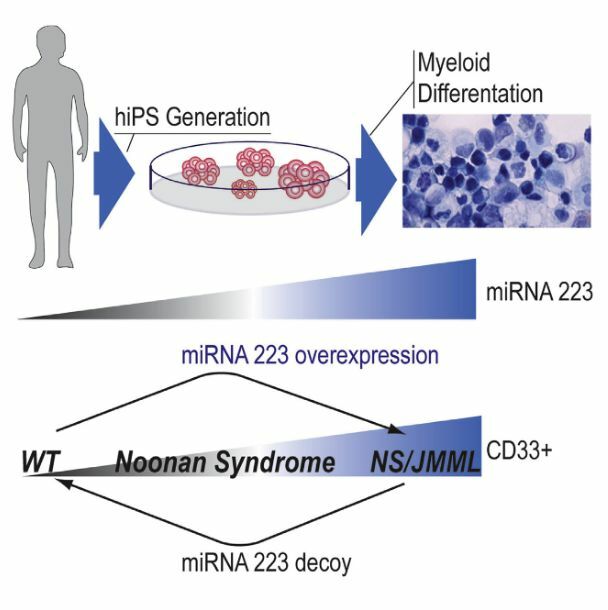 hiPSC-derived NS/JMML myeloid cells exhibited increased signaling through STAT5 and upregulation of miR-223 and miR-15a. Similarly, miR-223 and miR-15a were upregulated in 11/19 JMML bone marrow mononuclear cells harboring PTPN11 mutations, but not those without PTPN11 defects. Reducing miR-223’s function in NS/JMML hiPSCs normalized myelogenesis. MicroRNA target gene expression levels were reduced in hiPSC-derived myeloid cells as well as in JMML cells with PTPN11 mutations. Thus, studying an inherited human cancer syndrome with hiPSCs illuminated early oncogenesis prior to the accumulation of secondary genomic alterations, enabling us to discover microRNA dysregulation, establishing a genotype-phenotype association for JMML and providing therapeutic targets. Myeloid Dysregulation in a Human Induced Pluripotent Stem Cell Model of PTPN11-Associated Juvenile Myelomonocytic Leukemia. Gelb et al 2015.